request residence in the Kingdom Thailand. 1.1 holds a passport of his/her current nationality, which was granted a NON-IMMIGRANT VISA and has been permitted to stay in the Kingdom of Thailand on the basis of one year visa extension for the total of at least 3 consecutive years up to the application submission date. 1) A legal husband of wife. 2) A legal father of mother. 3) A child who is under 20 years of age up to the application submission date and must be single. Ministry of Interior will announce the annual quota of foreign to be granted with residence permit and such announcement will be published in the Government Gazette. Application can then be submitted until the last working day of the year. Detailed Information about the date and documents required for each category can be obtained at Sub – Division 1, Immigration Division 1, The Government Complex Commemorating His Majesty The King’s 80th Birthday Anniversary, 5th December, B.E 2550 (2007), Building B,2 Floor, Counter D,at Provincial immigration officer, or www.immigration.go.th-Applying for a resident’s visa in Thailand. Applicants must submit the applications in person and bring all documents required, for each category. Together with all of their passports. 3.1 The immigration officers will grant the applicants for 180 days extension of stay on the date of application submission first and the next extension will be granted for 180 days until the results of the applications cone out from The Immigration Commission. (1) Their fingerprint sheets are sent to the Criminal Records Division for the criminal record’s check in Thailand. (2) Their passports are checked by the black list system whether they are considered as “prohibited persons” according to the Immigration Bureau. (3) They are to be checked whether they are wanted by a foreign warrant of arrest by the Foreign Affairs Division. 4.1 The applications will be submitted for the consideration by The immigration Commission which consists of the representatives from The Ministry of Interior, The Ministry of Foreign Affairs, Kingdom of Thailand, The Royal Thai Police Headquarters, The Ministry of Labour, Office of the attorney General, The Board of investment of Thailand, The Secretariat of the National Security Council, The Tourism Authority of Thailand, and The Immigration Bureau with the final approval by The Minister of Interior. 4.2 To grant approval for the residence permit application, The immigration Commission will take into its consideration the applicants’ qualifications In terms of income, assets, knowledge, and other appropriate conditions due to current economic and social surroundings. And government policy. 4.3 Timing for the consideration process varies each tear, depending on the policy of The immigration Commission and The Ministry of Interior. 5.2 If the application is approved, the fee for the residence permit is 191,400 baht. However, the residence permit fee for spouses and children (under 20 years of age) of aliens who already had the residence permit or Thai citizens is 95,700 baht. Remarks : Documents which are in foreign language must be officially certified by the applicant’s national embassy located in Thailand, translated translated into Thai (e.g. name, telephone number), that can be varified later, must also be provided. And certified by the Official of Department of Consular Affairs, Kingdom of Thailand. WARNING: Submission of false documents or the provision of false statements are criminal offences This copy is for the applicant’s guideline only. It would be subjected to change by government policies and economic conditions. 19. 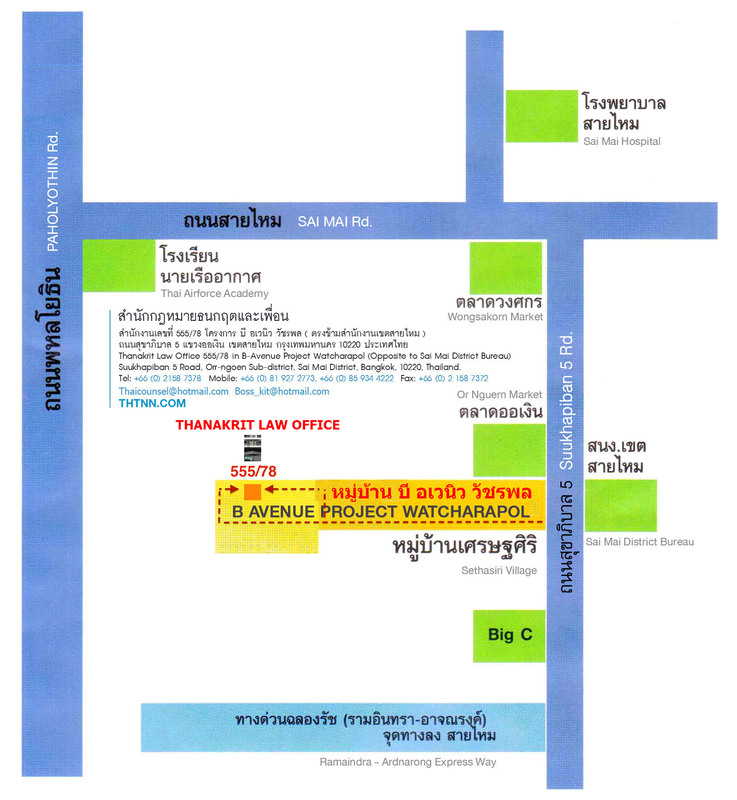 Personal information sheet (download at www.immigration.go.th – Applying for a resident’s visa in Thailand) and the photographs of; the applicant location in front of the workplace, outside the office (alone), inside the office with the stall, outside the factory (alone), inside the factory with the staff, with the machines and products (if any) also 10 photographs of the applicant with his/her family taking at the residence both outside and Inside. All of the photographs must be postcard size on A4 letter head (company stationary) with description. 20. In case of support Thai child, The DNA certificate from the government hospital to show a relationship between father, mother and child must be provided. 21. In case of support Thai spouse and had a child, The DAN Certificate from the government hospital to show a relationship between father, mother and child must be provided. 22. In case of Thai spouse have father and mother or either one of them is the alien, the copy of Birth certificate of spouse must be certified by the concerned organization, and the copy of Alien’s Certificate’ Certificate of Residence, House Registration of father and mother who got an authorized to have residence. If either of them pass away, a Death Certificate should be enclosed. 24. Additional documents which are considered as appropriate by the immigration officer. - Documents which are in foreign language must be officially certified by the applicant’s national embassy located in Thailand, translated into Thai (e.g. name, telephone number), that can be verified later, must also be provided. And certified by the Official of Department of Consular Affairs, Ministry of Foreign Affairs, Kingdom of Thailand. 3. Certificate of no criminal record from the applicant’s domicile which must be officially certified by Thai consulate in that country or the applicant’s national embassy located in Thailand, translated into Thai and certificate, by the Official of Department of Consular Affairs, Ministry of Foreign Affairs, Kingdom of Thailand. 4. Copy of the applicant’s educational certificate must be officially certified by the national embassy located in Thailand, translated into Thai and certified by the Official of Department of Consular Affairs, Ministry of Foreign Affairs, Kingdom of Thailand. 11. List of the share holders which is issued and officially certified by the Ministry of Commerce within the previous 3 months prior to the application submission date. And applicant, whose share exceeding 5 million bath, must show the list of shareholders 3 years backward. 20. Additional documents which are considered as appropriate by the immigration officer. 13. Personal information sheet (download at www.immigration.go.th – Applying for a resident’s visa in Thailand) and the photographs of; the applicant location in front of the workplace, outside the office (alone), inside the office with the stall, outside the factory (alone), inside the factory with the staff, with the machines and products (if any) also 10 photographs of the applicant with his/her family taking at the residence both outside and inside. All of the photographs must be postcard size on A4 letter head (company stationary) with description. 14. Additional documents which are considered as appropriate by the immigration officer.